Did you know that only one curbside recycling program existed in the United States 20 years ago. Why should we recycle? Because recycling is a GREAT way to protect our Earth and its natural resources, it's easy and fun to do. Recycling is using old materials to create new ones and it's an easy way you can make a really big diffrence in your environment. Newspapers can be recycled into school notebooks, plastic bottles can become park benches and juice pouches can be turned into purses. 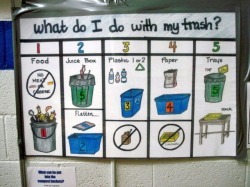 At the Public Schools of Petoskey we recycle paper, cardboard, tin, plastic bottles, glass and batteries. We have teamed up with the recycling programs that accept ink cartriges and juice boxes in order to be able to purchase items that are environmentally friendly for our school district. We use old magazines to make collages and other art projects. 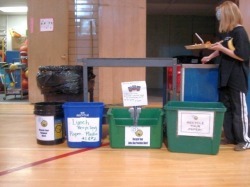 We are currently involved in composting our non-meat and dairy lunch waste at Lincoln Elementary School.